This extension provides blocks to change the game controls at runtime. For example, to switch between arrow keys and WASD for movement. To keep the key configuration between sessions, you can store the current configuration within a game attribute before saving the game. Then the configuration can be restored after loading the game. To get/apply the control config, you need Stencyl 3.1 or build >= b7140. 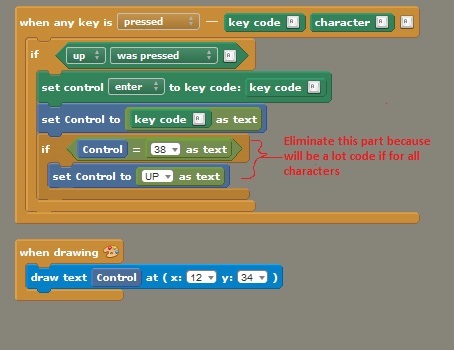 Sets the key for the selected control (no other keys will be assigned to that control afterwards). The names of the keys are the same as the fields in the Keyboard class (i.e. all upper case). Adds a key to the selected control (any keys that have been assigned to that control will still work afterwards). The parameters are the same as for the previous block. Sets the key for the selected control (no other keys will be assigned to that control afterwards). Expects the key code instead of the key name. Use for example with the "key code" block from the "Any Key". Returns a list containing all assignments of keys to controls. (It is an array of strings, where each string is in the form "control;key1,[key2,]...", but you don't need to care about that. ) Store this in a game attribute before saving the game if you want to keep the current controls. 1.2 Fix: some keys where not accepted; Add key code blocks. I updated the extension. It should work with all characters defined in the Keyboard class now. And I added blocks to use the key code (for example from the any key event) directly. Why hasn't anybody commented on this yet?! This seems awesome! Thanks Captaincomic. This is really nice. In my opinion, all it's missing is the ability to get individual control items or key codes. Everything else is there. Well done! I've tested it with a control scheme for my game (on Windows) and it's been acting odd. Even with 'replace controls', it's adding controls to the list. It's also adding to list items other than the ones requested and adding dupe controls. Finally, it's adding Ctrl and Shift as distinct controls even when they aren't being asked for, and it has a peculiar order of displaying them. These logs are the result of me mapping the same control repeatedly for each control, using the "set control" option, which is supposed to set and keep only one button for the control. It's a solid concept, but outside of Flash it has some major bugs. I'm confident in your ability to sort it out though. Best of luck! Edit 2: "Add key (x) to control (y)" crashes consistently on windows, presumably at 'Keys.remove(keyCode);' Could a conditional is-not-null check be missing? I can't get this installed on the Mac. Did just what the docs say (and I've installed other extensions). Went to Settings, Extensions, and 'Install Extension'. Minimo, the extension wasn't packaged right. It should now be possible to install it with that button. deepshock, sorry, I didn't see your post before. If you still have troubles with this extension, let me know. thank you ! Installation = success. In the process of integrating the extension into this game right now. Everything is working perfectly so far. Thanks for this awesome extension! I want to let the player choose which key he/she wants to set for a control (lets say chooce any key for moving left). How do i measure which key is pressed? Something like "set control to key PRESSED KEY "
The Input > Any Key event. Is there an easier way to get the name (to get UP right away instead of 38)? Where I put ? ?, just put whatever code the key code block generates. Wow! Cool extension! I never noticed this extension. I really needed a extension like this , thanks for creating it !!!! Thanks a lot for the help Justin, but i dont get it. Do i put your line into a code block? And with what exactly do replace the ?? Yeah, you put that line into a code block. Where I put the ? ?, it's the code equivalent of the [key code] block, which I wasn't sure of, so I used the "preview code" feature to find that out (see below).